4 oz Short crust pastry – made with 4 oz flour, 2 oz butter and some cold water. Make the pastry by rubbing the butter into the flour until it resembles fine bread crumbs. (At this stage you can add 2 oz grated cheese if liked) Then a tablespoon of cold water, stir round with a knife and add more water if necessary. Bring together with your hand until you leave the bowl clean. Turn onto a floured board and roll out to fit your flan dish. Cover the base of the pastry with baking parchment and add some baking beans (dried peas, dried beans or some dried pasta will do) Blind bake the pastry case for 10 mins. Meanwhile fry the bacon until soft, remove from the pan and chop up, fry the leek or onion in the same pan until brown. 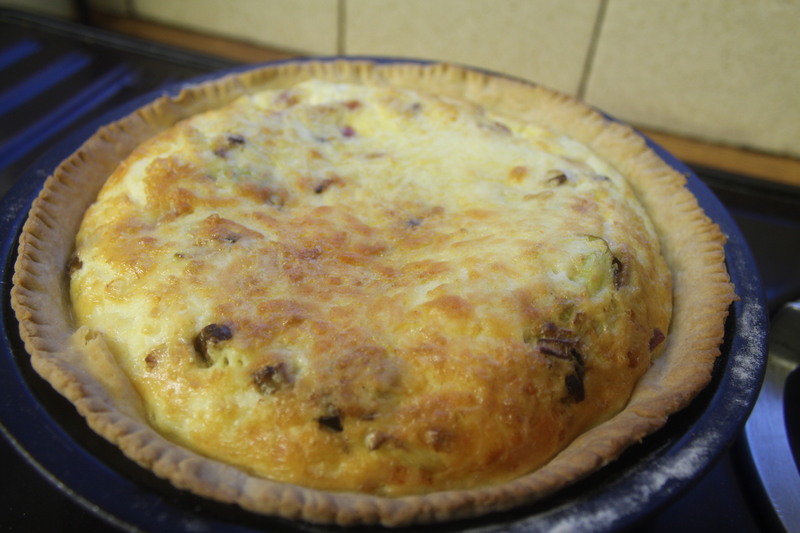 Beat the eggs with about a quarter of a pint of cream (this depends on the size of your eggs) add the bacon, cheese and leek and mix together. Pour into the flan case and add more grated cheese on top if required. Bake for approx 20 mins until set and firm to the touch. This is very good, when it has cooled slightly, with a nice cup of black tea.